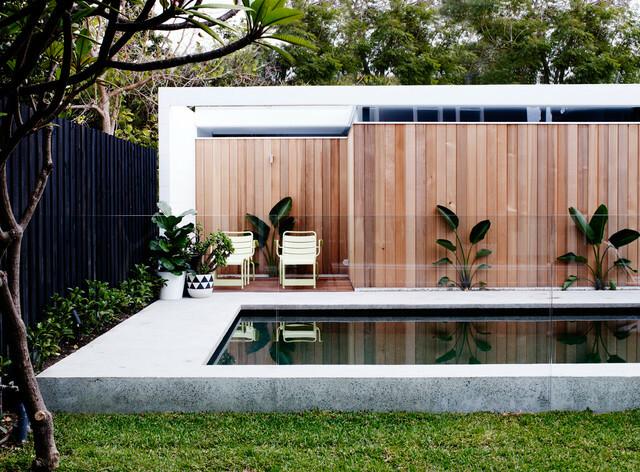 Seen here, the grassy backyard manages to include a functional garage and a luxurious pool. Designed by Landforms, the outdoor space has become an extension of the interior living area and is ideal for the Coogee summer lifestyle. Striking cedar cladding from Cedarspan disguises the garage and creates an appealing tactile timber wall, while exotic planting brings a tropical element that is restful and relaxing.